Me encontre' muy bien en el hostal, el personal es muy gentil, simpatico y disponible, me aconsejaron muy bien sobre lugar para visitar, como gastar meno, etc...L' atmosfera es muy agradable, he conocido jente linda y amable. La ultima noche compartimos una comida y un chico hizo uno show con el fuego...amazing! La ubicacion es perfecta y hay una teraza con una vista hermosa! By far the best hostel I've stayed in throughout my trip. The rooms are spacious and airy and the beds comfortable. 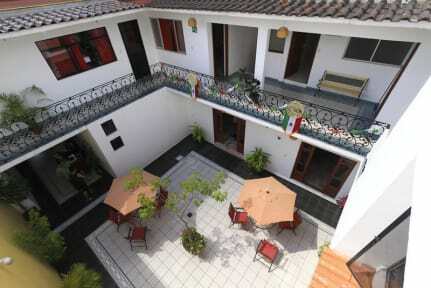 They have a wonderful terrace with great views over the city and a very well furnished kitchen. The best thing is the staff, professional and helpful at all times whilst being incredibly friendly. 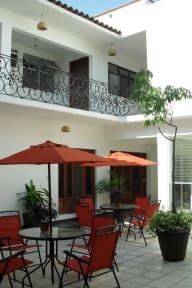 This is a very sociable hostel; staff and guests often hang out together in the common areas or go out about town, giving you an opportunity to experience the best nightlife in Oaxaca!